Annual membership of Castlefield Gallery Associates costs £60. You can pay online, by cheque, by bank transfer or by standing order. To pay online, please complete the form below. Castlefield Gallery, 2 Hewitt St, Manchester M15 4GB. To pay by bank transfer, please fill in the online form below – press Register to send us your details but ignore the subsequent Pay button. Then send an email to associates@castlefieldgallery.co.uk requesting the bank details. To pay by standing order, please fill in the online form below – press Register to send us your details but ignore the subsequent Pay button. Then send an email to associates@castlefieldgallery.co.uk requesting the Standing Order Instruction. CG Associates Membership - 60.00 GBP per 1 year - Ongoing. CG Associates Membership - 5.00 GBP per 1 month - Ongoing. I would like to receive updates about my subscription status via email. Castlefield Gallery Associates membership is open to artists, writers and independent curators working in contemporary art. Application for membership is for twelve consecutive months. To help spread membership payment, Castlefield Gallery can accept equal monthly payments (new members must pay 6 months in advance, then pay the remaining monthly instalments from month 7). Members will be notified by email on acceptance of their (first) payment, and will receive a link to the Castlefield Gallery Associates handbook. Castlefield Gallery reserves the right to share members' contact details with partner organisations when doing joint events. Castlefield Gallery reserves the right to share members' contact details with Fred Aldous Ltd in order for members to receive online shopping discounts from Fred Aldous Ltd.
Access to temporary spaces via Castlefield Gallery’s New Art Spaces scheme, which offers ‘pop-up’ project/exhibition spaces for artists and creative practitioners. An hour’s one-to-one advisory session with a key member of Castlefield Gallery staff. Access to professional development training and workshops provided by Castlefield Gallery. Members’ names and a link to their website listed on Castlefield Gallery’s website. Invitation to Castlefield Gallery exhibition launches and events. benefits may be subject to change at any time. Membership payments cannot be refunded once they have been made. membership, or may terminate or suspend the membership of any member. 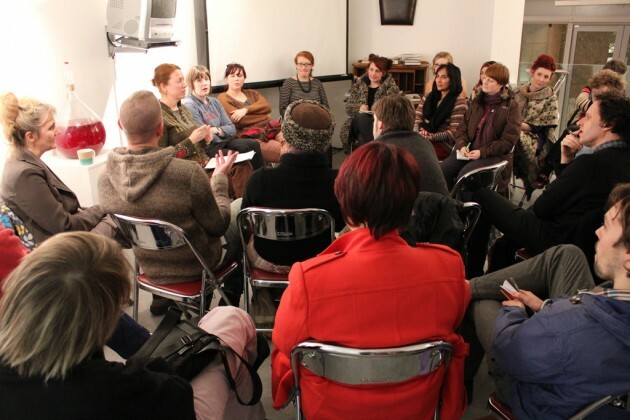 Groups can join Castlefield Gallery Associates if they have an established and documented collaborative practice. Groups can only get slots for advisory sessions or ‘crits’ as a group, rather than individuals sessions, and can only apply for a New Art Space as a group. For certain events, e.g. if there is likely to be limited places, groups can only send one member. Castlefield Gallery has an equality and diversity policy which aims to enable everyone to access the same opportunities and is backed by legislation to prevent discrimination based on prejudices against any group. NB These questions are all optional, but will help us build up a picture of the situation and needs of artists/art practitioners. All answers will be kept confidential. If you are a student, what level are you studying? If you are a student, what are you studying and where? If you are a graduate, what year did you graduate, from where and which subject? What percentage of your working week is spent on your practice as an artist/arts professional? What percentage of your income is currently generated through your practice? What are your primary motivations for joining the CG Associates Scheme? How did you hear about the CG Associates Scheme?